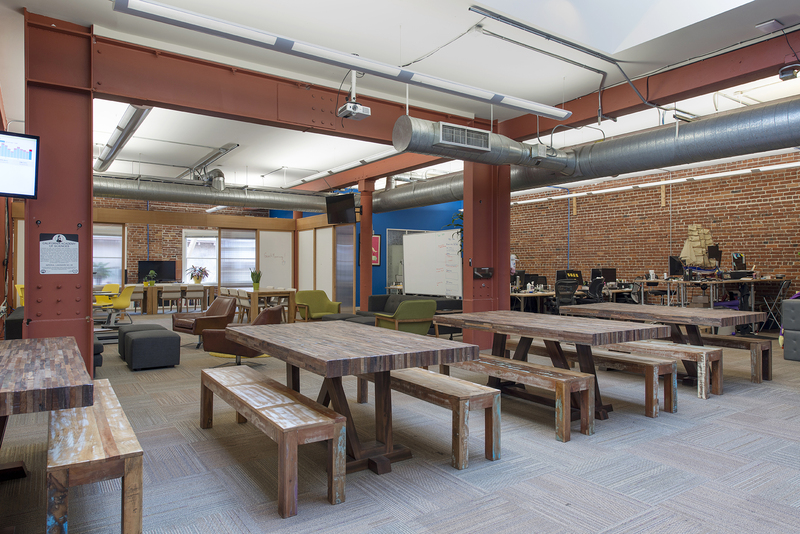 Whether you're moving to a new office, redesigning your existing space, or just hiring like crazy, this going to be a big undertaking with a lot of moving parts. You're busy, your company is doing great things, and you want your team to focus on what they do best rather than worry about selecting the right standing desk. Let me worry about that! Remote interior design and space planning services available using collaborative tools. 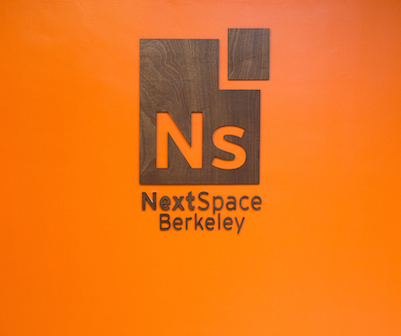 The cafe workspace at NextSpace Berkeley features a custom acoustic ceiling installation, custom seated and standing counters, and vintage accent furniture. 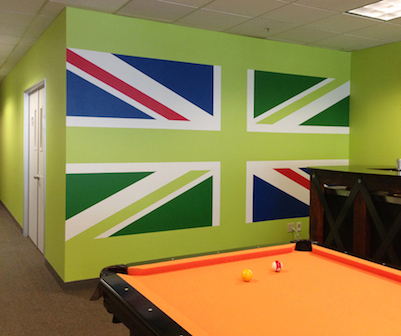 Finish specification and custom Union Jack wall design. Painting by Tobian Winzeler/Interior Surface Refinishing. 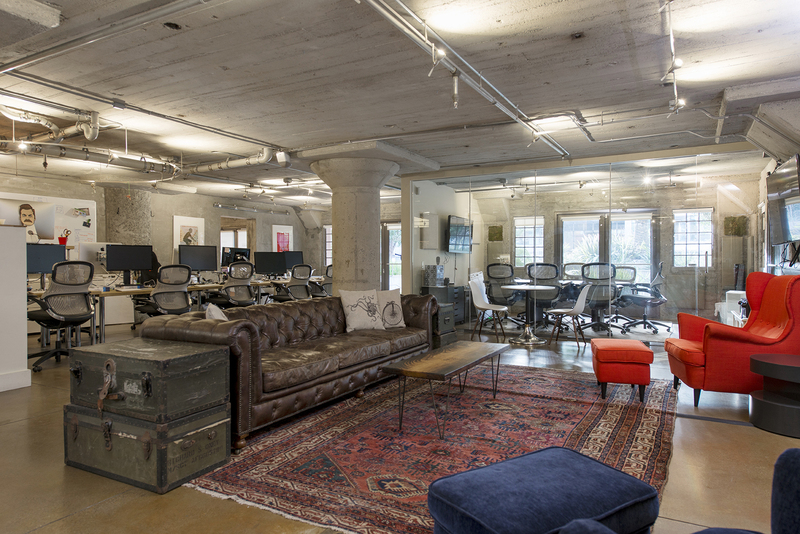 The office design features an open furniture layout with ergonomic workstations and a kitchen remodel, but the star of the show is the spacious lounge area that feels more like a beautiful living room than an office break area. 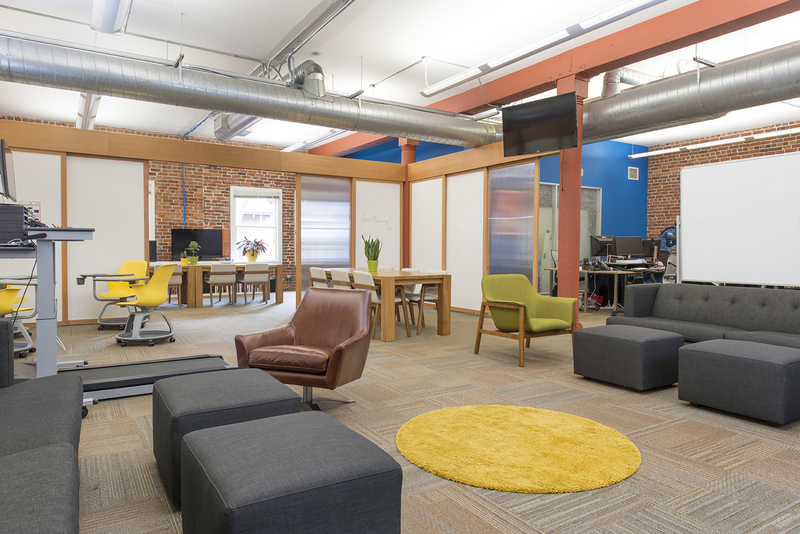 An underutilized corner of the office was redesigned to accommodate 2 meeting pods. 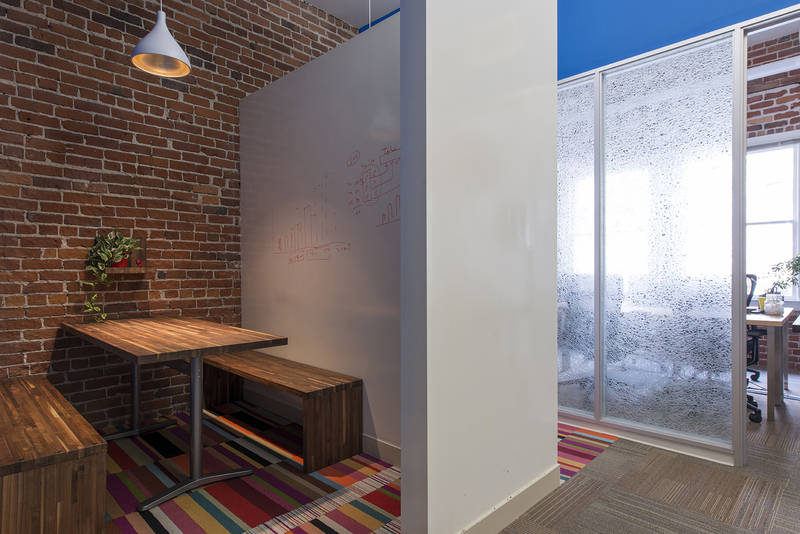 Each room features custom wood furniture, Idea Paint writable walls and candy striped Interface carpet squares. 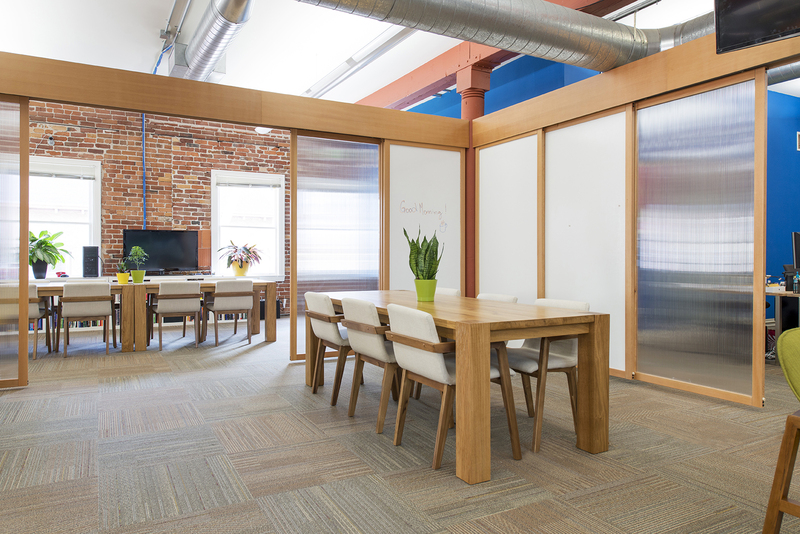 Finding quiet space in an open office environment can be challenging, so we built 2 pods for focused work, small meetings or phone calls. Workstations, communal areas and quiet spaces are spread throughout the office to encourage movement and interaction between teams. 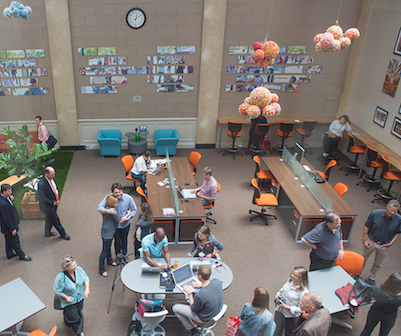 The spacious lounge and dining areas buzz with activity, while smaller gatherings or solo work happen in the cafe, library and meeting pods. A custom designed sliding partition system (featuring a combination of magnetic marker boards and translucent polycarbonate panels) separates workstations and the library from the main lounge area, providing a flexible solution that creates more privacy or openness as needed. 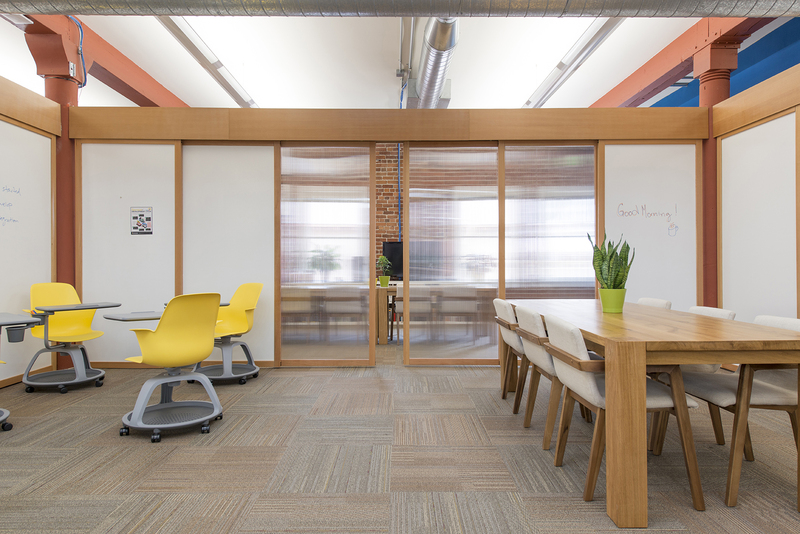 A custom designed sliding partition system incorporating magnetic marker boards and translucent polycarbonate panels helps to create areas for both focused and collaborative work without compromising natural light. 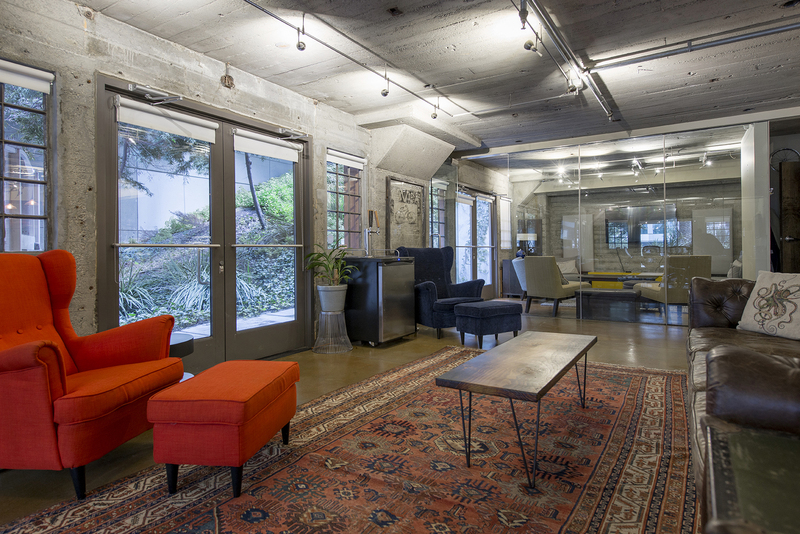 The concrete floors and walls create a neutral backdrop punctuated by pops of color. 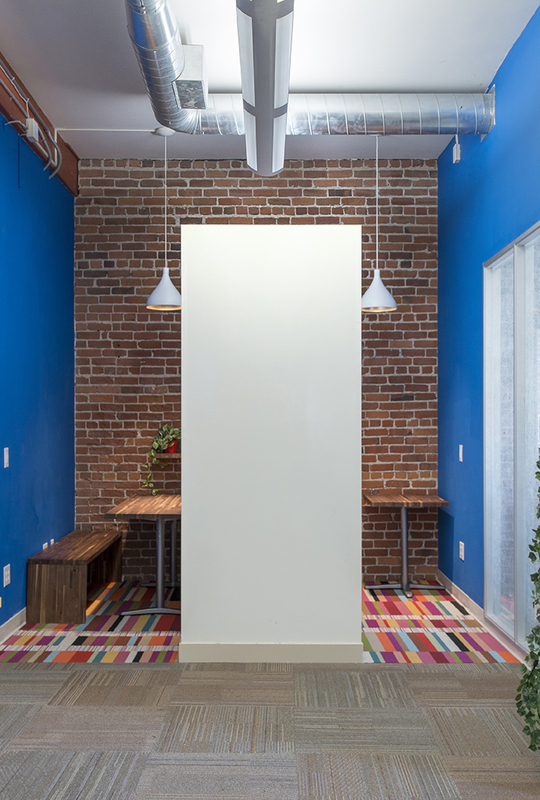 Custom call rooms were built from plywood and fitted with salvaged doors and custom shelving. 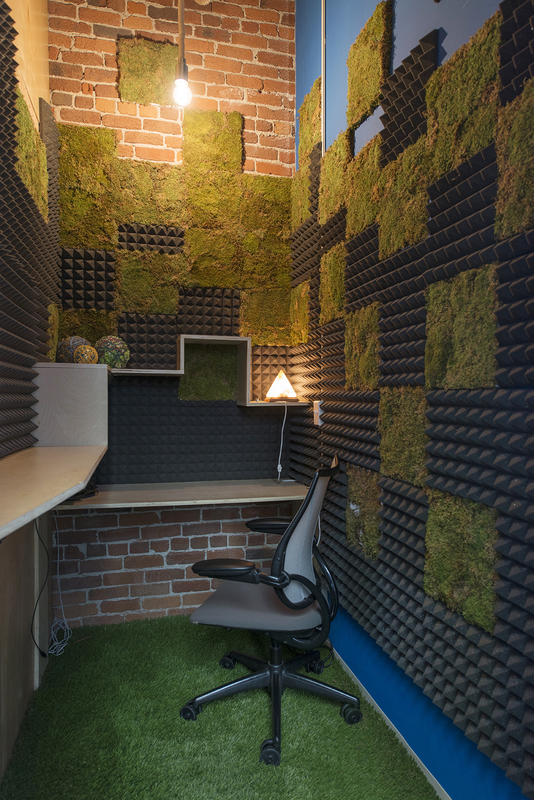 A unique acoustic and moss panel installation provides sound dampening, as does the SYNLawn grass rug. 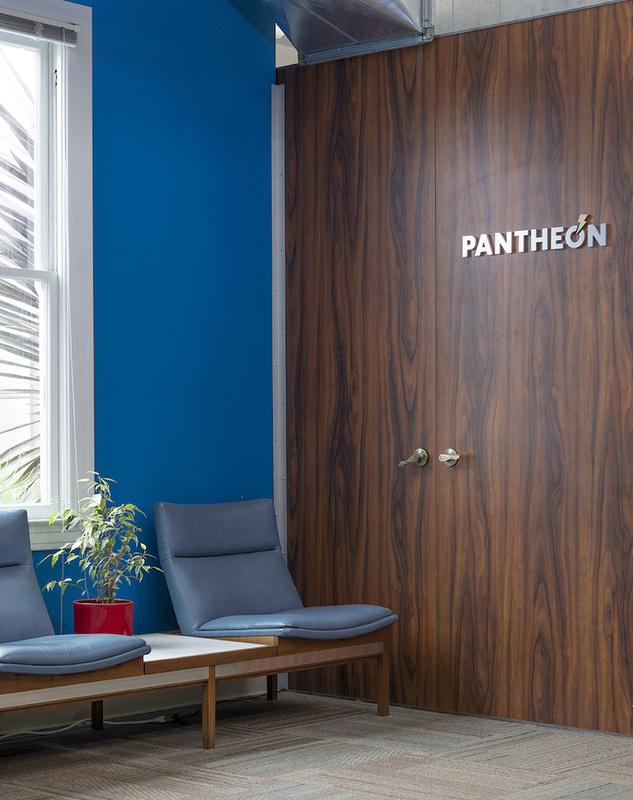 Pantheors eat lunch together everyday in the all-team dining area; this brings different teams together and fosters a social office culture. 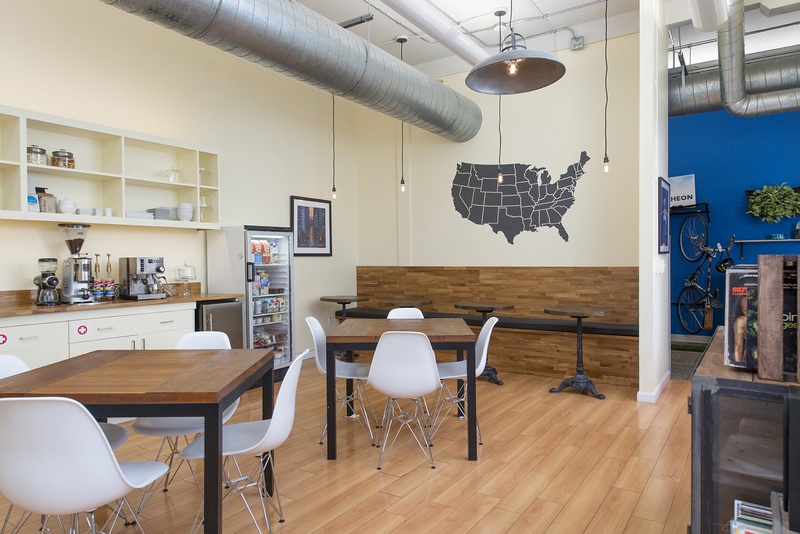 The cafe serves a break room as well as an informal meeting space, with a constant supply of fabulous coffee and snacks. 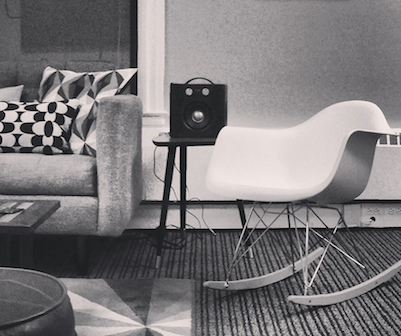 Casual conversations and spontaneous gatherings happen over coffee and a killer record collection in the cafe. 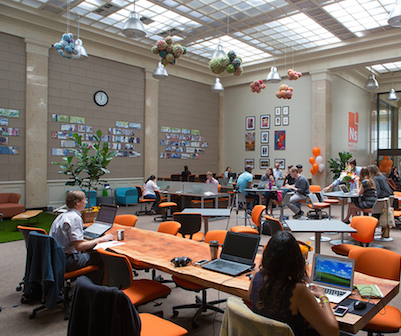 "Puff ball" clouds were designed as both an art installation and sound dampening solution for the open coworking environment. The balls were handmade using textured yarn and recycled materials. The Carnaby Street/Austin Powers inspired lounge area features vintage and new furnishings, an artisan reclaimed wood coffee table and psychedelic patterns. 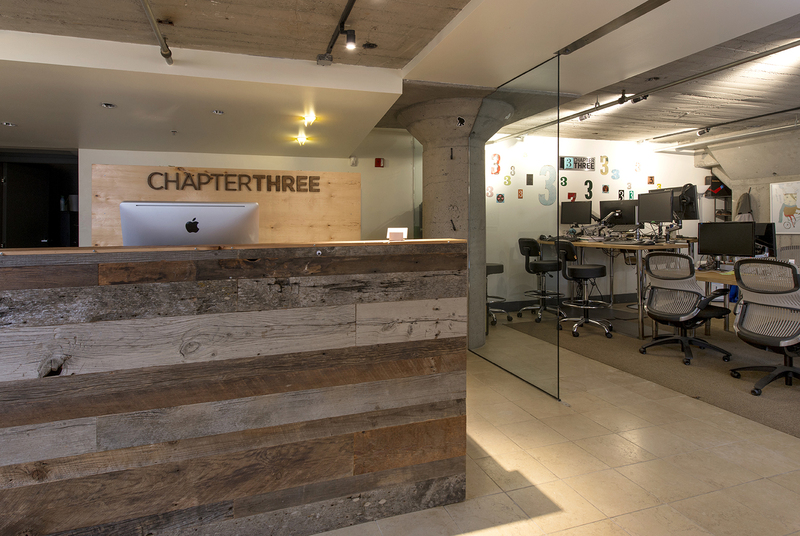 The custom reception desk was finished with reclaimed wood panels and wood signage. 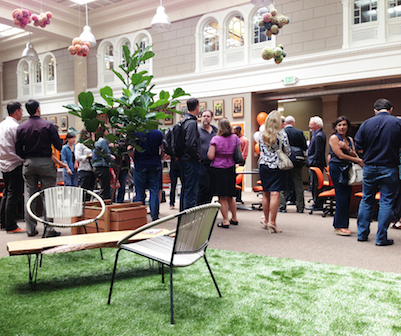 Behind the reception area are two desks separated by acoustic foam and moss panels for quiet workspace. Graphic patterns and mid-century style furniture detail in the Carnaby Street/Austin Powers inspired lounge area. 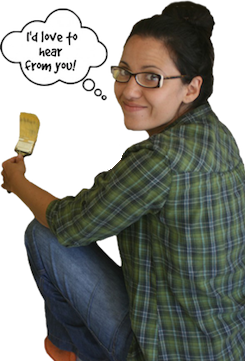 "Working with Interior Monkey has been an absolute pleasure. I used to think of interior design as a luxury, but through the process now see it as essential to a space as UX design is to software. 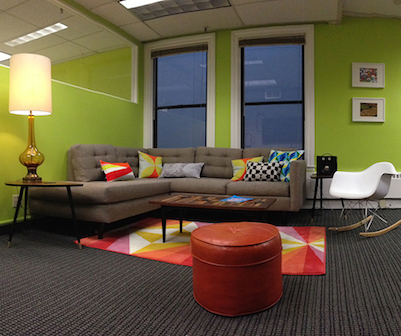 Without exception everyone who walks into devbootcamp comments on how friendly and inviting the space is. Reham listened carefully to what we needed, and worked swiftly and professionally within our limited budget to create a space that we're extremely proud of." Hi, I'm Reham Shadi. 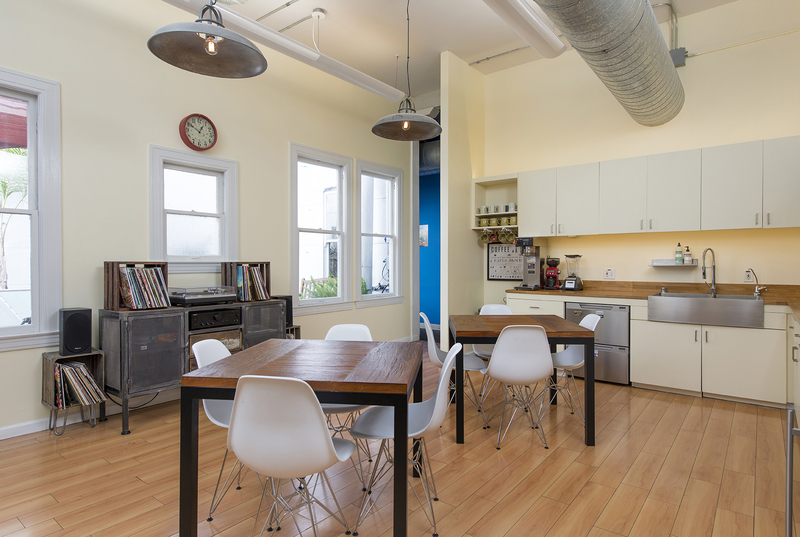 I founded Interior Monkey in 2011 to make it possible for startups and small businesses to create their dream office in a way they can afford. I believe that amazing spaces can be created on modest budgets and big ideas.